Zack Ruskin: Do you feel you could’ve written your novels in a different order, or did the process of writing The Russian Debutante’s Handbook and Absurdistan in some way inform Super Sad True Love Story? Gary Shteyngart: The Russian Debutante’s Handbook was written when the world was a much more optimistic place. The Soviet system had collapsed, America was doing A-OK, mister, the glaciers weren’t in full melt mode. With each book things get a little sadder. ZR: You incorporate a lot of foreign diction and accents into your prose. How do you decide when a Russian word is better suited for a sentence than its English counterpart? Is there any methodology to how you represent accents in your books? GS: I read aloud everything I write. Sometimes it sounds better in Russian, sometimes in English. My advice to budding writers: take acting classes. ZR: Super Sad True Love Story clearly has some roots in the dystopian futures of books like Nineteen Eighty-Four and more recently McCarthy’s The Road. What was your process for designing the “near-future” setting of your novel? Did you establish the details beforehand? Were there some aspects that didn’t reveal themselves until once you’d begun the story? GS: I hired an intern who knew something about science and the Intertube. He helped me to get this Facebooking account. I learned how to use an iTelephone. Then one hungover morning in Umbria, where I was finishing this thing up, I got the idea of an electronic talking otter. The rest just wrote itself. ZR: What were a couple of the last great books you’ve read, fiction or otherwise? 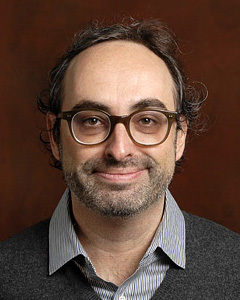 Would the high-school version of Gary Shteyngart have felt similarly, or has your taste in literature changed a lot in the intervening years? GS: Oh, so many great books out there. Anything Chang-rae Lee or Edwidge Danticat writes is genius, same for David Mitchell. High school Gary was not really in the frame of mind to read too many books. My upcoming memoir will explain more, I swear. ZR: For how funny Super Sad True Love Story is (as well as your other novels), there is a definite somberness and darkness in the text. Do you feel that humor is benefited by a dramatic counterpart in prose? Is it possible to write a funny novel that doesn’t have some semblance of sadness? GS: Funny without sad = not funny. Humor is a bait and switch strategy, a way to get people to laugh at things that if you really considered them would drive one off the ledge. ZR: As a fledgling writer myself, I’m always curious about how people transform from short story writers to novelists. Did you start in the short story format? Do you continue to write short stories? At what point in your career did you think you could complete a whole novel, or were you confident you wouldn’t finish until one day it was done? GS: I’ve written maybe three published short stories, and two were dry runs for Absurdistan. I respect short story writers a lot but that ability to condense the world into ten pages is sadly not one of my strengths. I just like to blah blah blah for 300 pages. ZR: You made a hilarious advertisement for your book, one that featured cameos from actor James Franco and author Jeffrey Eugenides, among others. What inspired you to film a commercial for a product that is typically only advertised on the pages of the New York Times Review of Books and the like? Do you think books need an advertising revitalization? Do you have any idea if your ad helped sell copies of your book? GS: Yes, we have to make people read books again, and the only way to do that is to go on this Facebooker (please check out my Facebooker page, many photos of my dachshund) and to make trailers. Speaking of, stay tuned for my paperback trailer, featuring a very special guest star! ZR: If you could watch a no-holds-barred fight between any two authors, living or dead, who do you put in the ring, and which fighter is your money on? GS: I’m not a violent man, so I’d prefer to see people give hugs in a big ring. If Hemingway and Norman Mailer could just hug for two or three minutes while a crowd of thousands said “Awww…” well, then we’d really have something, wouldn’t we? This interview appeared on the Book Passage blog on May 10, 2011.